Very late, here are my moments of happiness from the last two weeks. Joining in with Jen from little birdie. ♥ Our eldest celebrated his 18th last week quietly in Cornwall, amongst family and friends at home over the weekend and then on Thursday night with his mates (not so quietly I guess). Tonight he is home safe and sound, I'm glad to say. ♥ Foodie highlights from the last two weeks have been making bread in the bread machine at Peace and Plenty, a double yolker from their hens, pasties and yummy lunches and coffees whilst out and about in Cornwall. ♥ Getting to know my new camera. I took many, many photos in Cornwall and enjoyed this new pastime, usually dragging behind hubs and the boys seeking out any photo opportunity. 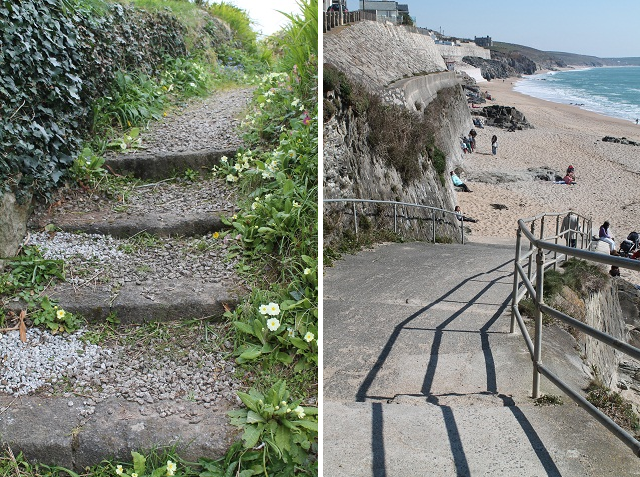 Taking this snap of these pretty primrose steps in Mousehole a friendly lady asked me "Is that your family ahead?". "Yes, are they moaning?" I jokingly replied as I jogged up the hill to catch them up. She laughed and said "Good for you". Must be a blogger I thought. The second photo is at the beach in Porthleven. ♥ Finding Rob Ryan washi tape at The Exchange art gallery in Penzance. Sadly, we don't have any art galleries in our home town. Coffee in an art gallery is my idea of bliss. Hope you have enjoyed a few moments of happiness this week. Oh, the colour of those egg yolks! Yum. Happy Birthday to your boy. 18 is a big deal birthday! Happy birthday to your boy. Also there is no such thing as too many photos! Happy birthday to your lovely boy. I know what it is to stay awake waiting for their safe return...Primroses are one of my favourites. I nearly crashed the car a couple of days ago because I was distracted by a huge bank of them. Just beautiful. Porthleven. One of my favourite places. looks like you had a lovely time in Cornwall. I like seeing your images for your 52 weeks of happy. Belated birthday wishes to your son! I'm glad you are enjoying your new camera, my family leave me way behind too when I get out the camera! Lovely photos, you and your new camera are doing well together.